The potential for offshore wind along the Turkish coast is considered great. Experts speak of 7 to 10 gigawatts in the Mediterranean. WindEurope even saw a potential of up to 32 GW a year ago - but this would require the technology of floating wind turbines to be ready for the market first, because then the Black Sea would also be a possible location. In order to be able to exploit the potential as quickly as possible, the Turks are now counting on Danish support. An energy cooperation between the two countries has already existed since 2017, initially to promote the green transition in the heating sector in Turkey. But there's more to come. "The Turkish authorities have applied for an extension of our existing energy cooperation, and we see this as recognition of the cooperation to date and the trust they have been placing in the Danish Energy Agency. We are looking forward to good results where we will have the opportunity to make Danish experiences and solutions for offshore wind visible", says Deputy Director Martin Hansen of the Danish Energy Agency (DEA). 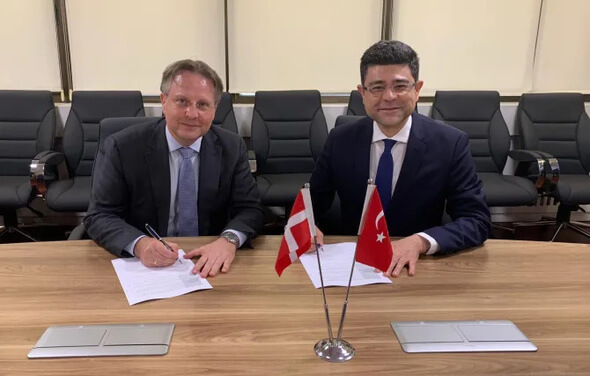 On the basis of their experience, the Danes will advise the Turkish authorities on the development of strategies and solutions in the field of offshore wind. Turkey is particularly interested in the planning and supply of offshore wind farms. In doing so close dialogue with the industry and transparent and efficient public administration will ensure good bid prices for investors and project developers. With a rapidly growing economy and an increased demand for electricity, the Turks are concentrating on using their own energy sources and minimising their high dependence on imports. Over the past ten years, intensive investments have already been made into wind expansion: From 146 megawatts in 2007, the wind capacity was expanded with onshore projects to approx. 7,000 megawatts by the end of 2017, as Hürriyet Daily News reports. Competent help was sought from abroad, but the profit of the domestic economy was also ensured. Thus projects may only be implemented if a percentage of the components are manufactured directly in Turkey, which led to various manufacturers setting up facilities in the country. A similar concept is now likely to be envisioned when it comes to providing start-up assistance for offshore wind energy. It will be interesting to see whether the errors from the onshore expansion will be repeated: Above all, a lack of infrastructure is still hampering many wind projects in the country, as the power grid is unable to cope with the rapid expansion of onshore wind power. On the Danish side, the cooperation offers a unique opportunity to shape the start of the Turkish offshore sector, not least with regard to the dissemination of Danish energy solutions and the positioning of Danish players and companies on the market. The anticipation is correspondingly great: "I am really happy that the existing cooperation has borne fruit and is now being extended to offshore wind. The positive cooperation so far contributes to the fact that I have great expectations of the new project", explained the Danish Ambassador Svend Olling at the signing ceremony. Denmark has so far installed around 1.7 GW of offshore wind and is one of the pioneers of offshore wind energy.